The freedom and responsibility of choice is one of the basic tenets of Baptist beliefs. Seventh Day Baptists as a part of this Baptist heritage for over 350 years have upheld and practiced that right. The decision to follow the Bible instead of ecclesiastical authority and tradition led them to accept the seventh day of the week as the Sabbath which sets them apart from other Baptists, but as Dr. Winthrop Hudson noted, “Seventh Day Baptists are separate but not sectarian.” A Choosing People: The History of Seventh Day Baptists documents the history of this oldest Sabbathkeeping Christian denomination within the framework of both religious and secular history from the Reformation in Europe to modern times in America. Mid-seventeenth-century origins amid persecution gave way to gradual decline in England but dramatic growth in America through development of associational relationships during the eighteenth century. Churches struggled to apply ideals of freedom and equality to harsh realities of the American Revolution and Civil War. Nineteenth-century expansion with the western frontier fostered organization of a General Conference and related societies in missionary and educational outreach despite continuing tensions between autonomy and associational ties. A mission to China lasted one hundred years and spawned global extension leading to establishment of a World Federation of conferences at the same time that twentiethcentury social, scientific, organizational, ecumenical, and theological issues challenged all Christian groups. 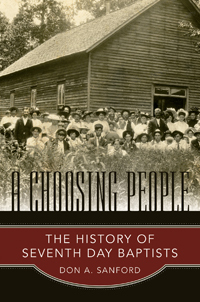 Originally published in 1992, this book has been thoroughly updated to the present and brings greater accuracy and thoroughness to this engaging history of the choices, struggles, and beliefs of Seventh Day Baptists.